A Poor House was established in the parish of Saint Budeaux in around 1650. In February 1823 steps were taken to provide a workhouse for the parish. But in June 1827 the management of the Poor House decided that all new inmates would have their own clothes removed and placed in storage until they left, being forced to wear what they called Common House Dress instead. The Saint Budeaux Poor House after being converted in to two dwellings. Courtesy of Plymouth Library Service. By 1835 the property had become so dilapidated that it was decided to transfer all the remaining inmates to the Plympton Saint Mary Union Workhouse at Plympton. The eastern portion of the Poor House was then reconstructed as dwellings and the western part acquired by the trustees of the Saint Budeaux Foundation School for use as accommodation for the master and mistress. The first floor rooms were used as class-rooms. 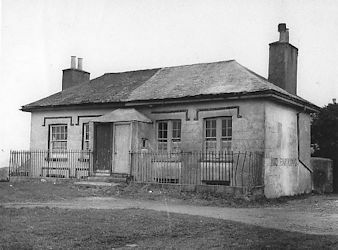 The cottages escaped being acquired by the War Department in 1863 for the site of Agaton Fort and remained until they were demolished in June 1962.